Taiwan Otsuka Pharmaceutical was founded in 1974 with a mission to “create new products for better health worldwide”. Under the continuous efforts of Otsuka’s staff, the company has been quite aggressive in expansion, facility upgrade, and technical upgrade, aiming to bring our customers high-quality products and lead Taiwan’s pharmaceutical industry in the global trend of upgrading injection containers to high-quality Plabottles. In 1984, Taiwan Otsuka was rated a Grade A plant by the Department of Health and, in 1986, Taiwan Otsuka received the GMP certification from the DOH, and products made in Taiwan were exported to foreign countries. In 2010, Taiwan Otsuka got the approval of PIC/S GMP by the Ministry of Health and Welfare, Taiwan. This shows that the quality of Taiwan Otsuka’s products has achieved world standards. Taiwan Otsuka continues to research and develop new products under the “Otsuka Spirit”. In the 1970s, Taiwan Otsuka directed its focus on meeting the local needs in medical care. The Company consulted the experts in the domestic society of medical care to develop several multi-ingredient electrolyte infusion solutions, such as the TAITA Injection Series. Furthermore, in the 1980s, Taiwan Otsuka began to introduce several drugs developed by Otsuka Japan into the Taiwan market, including Meptin for Asthma, Mikelan LA OS and Arteoptic for glaucoma. Since Two thousand, Taiwan Otsuka began to launch the Pletaal for intermittent claudication and Abilify for schizophrenia, MDD and bipolar; and then Samsca for hyponatremia to care for the health of the people in Taiwan. 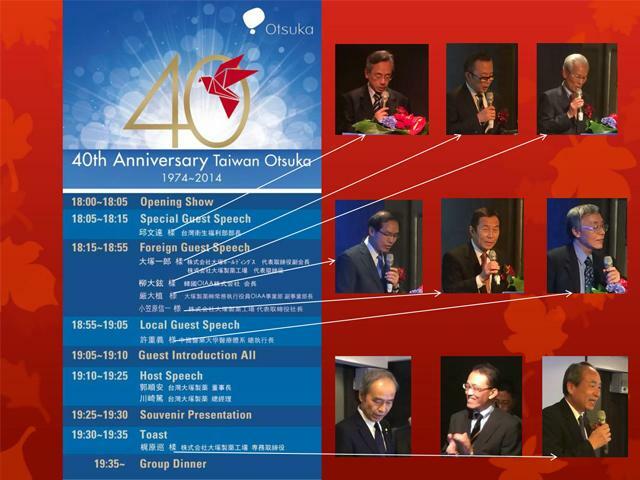 During the past 40 years, Taiwan Otsuka has established a good reputation in the pharmaceutical industry of Taiwan, but we are not satisfied with these achievements. Pharmaceutical technologies are advancing day by day; our quest to better the health of people and society continuously. We strive to achieve our goal with an open mind to the valuable recommendations from all fields in the society under our model of “Integrity, Innovation, and Service”. © 2011 TAIWAN OTSUKA PHARMACEUTICAL CO.,LTD.